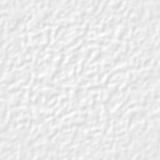 Fourteen billion years ago, just after the Big Bang, the universe was an expanding fireball, white hot and nearly uniform. All of space was filled with elementary particles and radiation. "Soupy" is how some cosmologists describe it. Today the universe is completely different. It's still expanding-even accelerating-but there the resemblance ends. The universe we live in now is "lumpy." Great cold voids are sprinkled with glowing galaxies. In galaxies, there are stars. Around stars, there are planets. On one planet, at least, there is life. How we got from there to here is a mystery. Finding out is the goal the Galaxy Evolution Explorer, "GALEX" for short, a small NASA spacecraft launched into Earth orbit April 28, 2003. GALEX carries an ultraviolet (UV) telescope for studying galaxies as far away as 10 billion light-years. "GALEX is a time machine," says astronomer Peter Friedman of Caltech. Because light takes time to travel from place to place, pictures of distant galaxies reveal them as they were in the past. "GALEX is investigating the evolution of galaxies over 80% of the history of our universe." The Hubble Space Telescope can see faraway galaxies, too, but GALEX has an advantage: While Hubble looks in great detail at very small regions of the sky, GALEX is surveying the entire sky, cataloging millions of galaxies during its 2-year mission. GALEX is a UV mission for a reason. Friedman explains: "UV radiation is a telltale sign of star birth." Stars are born when knots of gas condense in interstellar clouds. The ones we see best are the big ones-massive stars that burn hot and emit lots of UV radiation. "These stars are short-lived, so they trace recent star formation." Understanding star formation is crucial to studies of galaxy evolution. When galaxies collide, star formation surges. When galaxies run out of interstellar gas, star formation wanes. In galaxies like the Milky Way, spiral arms are outlined by star-forming clouds. The shapes of galaxies, their history and fate =8A they're all connected by star formation. Even life hinges on star formation, because stars make heavy elements for planets and organic molecules. "Our measurements of UV radiation will tell us both the rate at which stars are forming in galaxies and the distances of the galaxies," says Friedman. How did we get here? GALEX will show the way. Find out more about GALEX at www.galex.caltech.edu. For children, visit The Space Place at spaceplace.nasa.gov/galex_make1.htm and make a beautiful galactic mobile while learning about some of the different shapes galaxies can take. 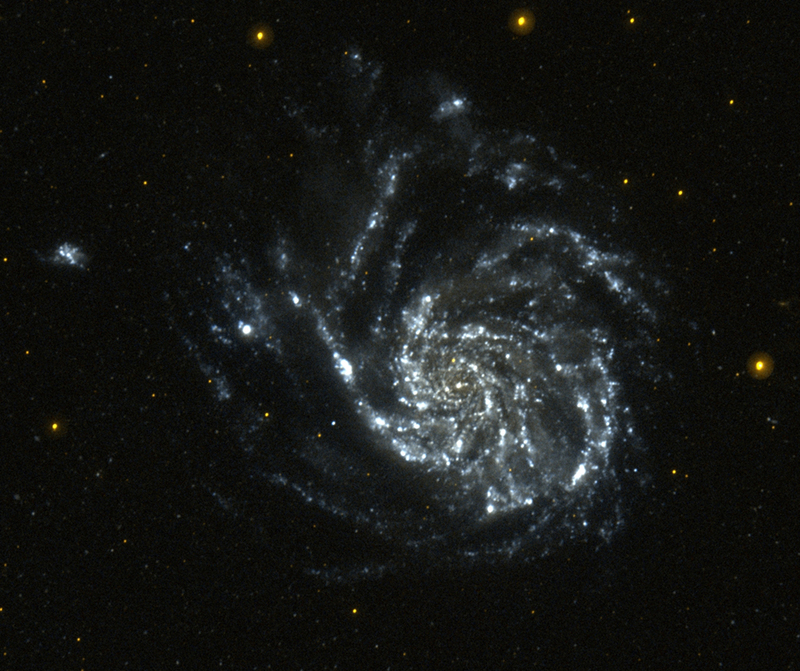 This image of Messier 101 (M101), aka the "Pinwheel Galaxy," was taken in two orbits of GALEX on June 20, 2003. 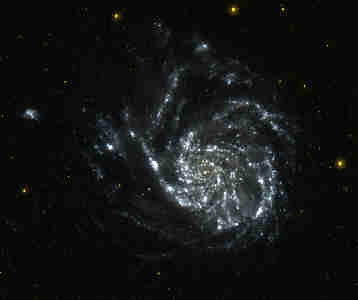 M101 is 20 million light years away.